Yashar Party supporters. March 2019. Image from Twitter. Eran Etzion is the former Deputy head of the National Security Council and Head of the Policy Planning Division in the Foreign Ministry. 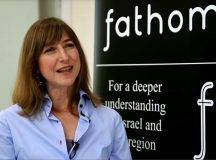 In this conversation with Fathom, he tells us why, in the age of the app, he has established a new political party, Yashar, and why he believes it can be the future of Israeli democracy. During my 25 years in the foreign ministry I was privy to the political dynamics between the political echelon and the professional echelon. It struck me that regardless of who was Prime Minister – and I served during the time of Sharon, Olmert and Netanyahu – there were many similarities in how governments operated. Moreover, I came to see that the relationship between the government and its citizens was broken. Essentially, I saw a profound disconnect between the decision-making process and the wishes of the citizens. This was brought home particularly sharply during the mass social protests of 2011. As both a citizen and senior civil servant I expected the government to treat those concerns with respect, and to respond seriously to the genuine needs that were expressed by the protestors. But the instinct was rather to squash the citizenry in order to maintain the political status quo. While this was a Netanyahu government, it was clear to me that it probably wouldn’t have been significantly different under someone else. This was very troubling to me and these experiences eventually led me to create Yashar. This gap between citizens and elected officials is not just an Israeli phenomenon. A deep structural crisis is being experienced by democracies around the world – in the UK, throughout Europe, the US and even in Japan and South Korea. Essentially, there is a collapse of trust between the political system – built around political lobbies, big money and special interest groups – and the state’s citizens. This has been the case for decades, but today technology and social networks allow citizens to be more aware of the situation. The product of these two trends – the rigged political system on the one hand and the global political awakening on the other – has created a new zeitgeist marked by deep mistrust of the political class. This is the most critical driving force of our time. And Yashar was created to establish a genuine and enduring connection between the members of our party (who are regular members of the public) and parliament. We need to reinvent parliament in a way that will solve the crisis of trust. For now, we decided to start political renewal at the level of the political party by creating a unique application which connects all Yashar party members with its representatives. Each member commits to our platform which is liberal-democratic in nature, and, in contrast to other parties, takes clear positions on all critical issues. Our manifesto calls for, amongst other things, fighting corruption by public officials; establishing a constitution; cancelling the Nation State Law; creating plans to build new Arab communities; working towards separating religion and state; and attempting to achieve a regional agreement with Israel’s neighbours based on the Arab Peace Initiative and other relevant Arab League decisions. Once you become a member you can vote and influence how your party’s representatives vote and act throughout the term of the next Israeli Knesset. Under no circumstances will Yashar’s elected officials vote against the will of our party members. Our promise to our party members is that we won’t break the promises that we make. And with this we solve the issue of mistrust. Yashar identified two years ago that the overarching mistrust that had caused the collapse of established parties in France and Germany would happen in Israel too. This has proven to be accurate, as the collapse of the Israeli Labour party shows. Other well-established parties on the left and right are also struggling to pass the threshold. 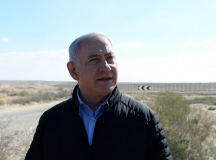 The main issue on which the election is being fought is Netanyahu himself, and the results will be a validation (or not) of Netanyahu and a verdict on his corruption charges. I believe Netanyahu will be forced to leave office very shortly after the elections. It’s certainly clear he won’t be able to serve his entire term. In this sense, he is running as a ghost candidate, yet he is acting like a fully-fledged candidate and unfortunately everyone is responding accordingly. 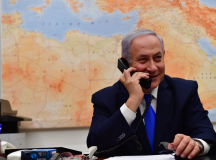 Ultimately though, the main question Israeli voters will need to decide is ‘Netanyahu in or out?’ The jury is still out – there are too many unknowns, and anything is still possible. 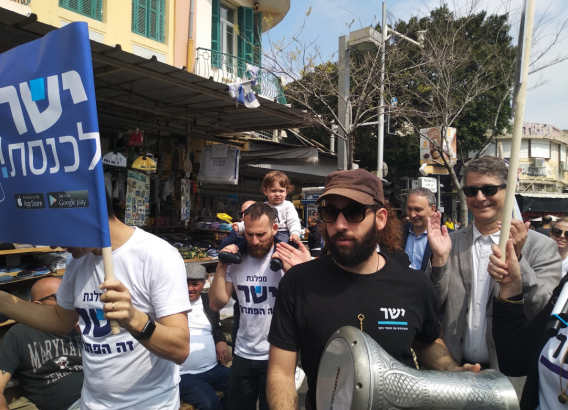 Another component of the election is that Netanyahu’s main rivals, Blue and White, have created a party which is essentially all of Netanyahu’s policy (on Iran, the Palestinians, the economy) just without Netanyahu. 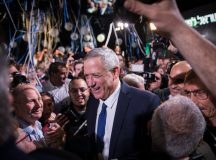 Gantz and Lapid are trying to court right wing voters. There is also a chance, especially if Blue/White stays in opposition, that they will divide into three parts. I believe the most realistic scenario will be a Likud and Blue/White national unity government, with the only question being who will form it and who will join it. Either way, it will be a continuation of Netanyahu’s policies, which is not good news for anyone. In Israel the threshold is 3.25 per cent. That is not easy for a new party, but we think it’s doable. Yashar believes that because we have a new and innovative model, we will be able to attract certain sectors and constituencies that no one else will be able to reach. Firstly, we are aiming to recruit the 1.5 million Israelis who didn’t vote in 2015, many of whom have lost trust in politicians. Second, the 500,000 young voters who are voting for the first time. Many of them are excited about our model and application and its combination of technology and politics. Third, there is much interest in the Yashar model in the Arab population. While they are being attacked and delegitimised, the secular, educated younger generation is very much looking to integrate economically and socially and Yashar offers them this opportunity. Fourth, certain segments of the Russian-speaking community amongst whom more than 500,000 are not considered ‘legitimate Jews’ by the Rabbinical establishment and who have difficulty marrying. Given what Yashar offers them in terms of the separation of religion and state, civil marriage etc, we believe a lot of them may vote for us. The whole idea isn’t just to go into Knesset but to change the political system. But I firmly believe that this type of model – binding party membership with party representatives in parliament through a combination of technology and ideology that ensures the members can trust and influence the votes of its representatives – has already begin to work. In Italy, the 5 Star Movement won the elections, and Podemos in Spain won 20 per cent of votes using a similar model. Moreover, 19 political parties have sprung in the last four years in Europe using similar models. We see one model for the future of democracy in Hungary, Poland and elsewhere. But our model is an alternative; it represents the optimistic future of democracy. And those who seek enlightened real democracy should see this model as the way forward. An interesting article : one that’s firmly based upon democratic principles, treating all peoples as equal, something that is totally missing in the present day Jewish state of Israel. Furthermore, it offers an opportunity to move away from a Medieval concept , that of two united pillars of power : the monarchy ( modern day government) and the Church (Judiasm). If these pillars of power can be separated we will witness a big step forward, into the 21 st C.
I wish Eran Etzion and his Yashar Party the best of luck and applaude him for his perceptive, forward looking political ideas.